I know you’d never fire off a snippy email but I’ll bet you work with people who would and do. I know this because I’ve experienced it and I also hear about it every single week from people in corporate America. So this post isn’t really about you. It’s for you to share with those other people. From now on when I say “you” I mean “them.” Moving along. Being snippy doesn’t really help you. When I get a snippy email it doesn’t put me in my place like you hoped it would. It just makes you look like a bit of a jerk. Maybe or maybe not. The test is really easy. If you wouldn’t say it exactly that way to someone’s face, then don’t say it that way in an email. You may think you can hide behind your keyboard but unless you’re an anonymous internet troll your behavior affects how people perceive you. You don’t want people to think you’re a bit of a jerk, do you? Think Time is the Problem? It does takes a few more seconds to craft an email with the right tone; seconds that are totally worth taking. If your schedule is so jammed that you think you don’t have time to make certain you’re treating people with kindness and respect, then it’s time to rethink your workload and your priorities. Call me because I can help you. When your workload and priorities are under control, not only do you get more done, but you’re less likely to be in the annoyed frame of mind that made you write that snippy email in the first place. What a cool bonus. Thanks (or no thanks) to technology you have the opportunity to connect with dozens if not hundreds of people every day via email and social media. Every time you put something out there you have the chance to bring people up or deflate them. 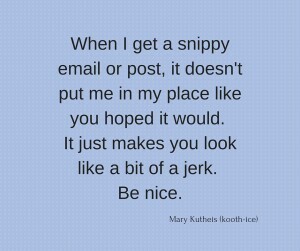 Usually the reason for snippy emails or posts is because something else is going on making you angry or hurt or scared. Maybe just fix that and everybody comes out better. Be nice. It’s just that easy. P.S. Here’s a funny and insightful video where Louis C.K. talks to Conan about the perils of saying nasty things via phone. Closely related to the snippy email. It’s also worth it to watch both of them try to imitate Bruce singing Jungleland.